Whenever I read or see a story about animals I seem to always get teary eyed. Animals are some of the best friends we can have. They ask for nothing, but they give everything in return. Animals represent all that is good in man. Just read about this brave doggie and yes for moments there I was all sad and caught up in an emotional roller coaster. I think of our Brutus and of the 5 kitties I used to have. British soldiers and military dogs gathered at a London army barracks Thursday to honor a fallen hero with selfless courage nerves of steel — and four legs. This doggie is named Theo. 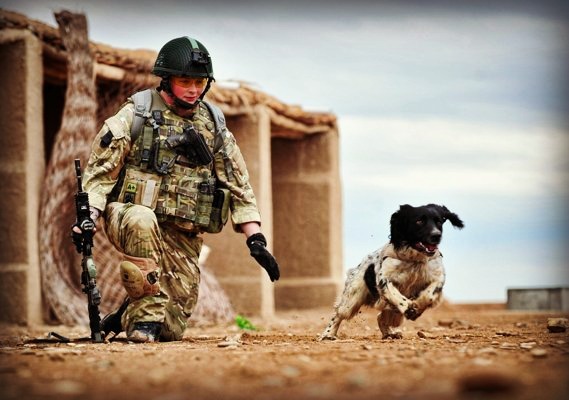 Theo, a bomb-sniffing springer spaniel died in Afghanistan on the day his soldier partner was killed, and was posthumously honored with the Dickin Medal, Britain's highest award for bravery by animals. All I know is that the world is a better place because of the wonderful four legged creatures we call our friends and companions. I can't picture our life without Brutus. Brutus is always waiting beside Arvid. Where Arvid goes rest assured Brutus is never far behind. The greatness of a nation and its moral progress can be judged by the way its animals are treated..
Labels: There is no psychiatrist in the world like a puppy licking your face. The average dog is a nicer person than the average person.